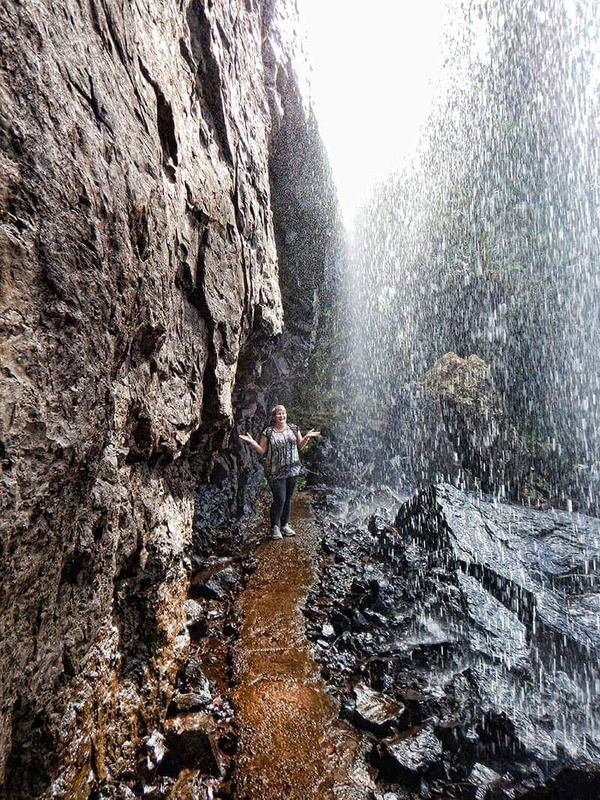 The most spectacular short hike on the Gold Coast! 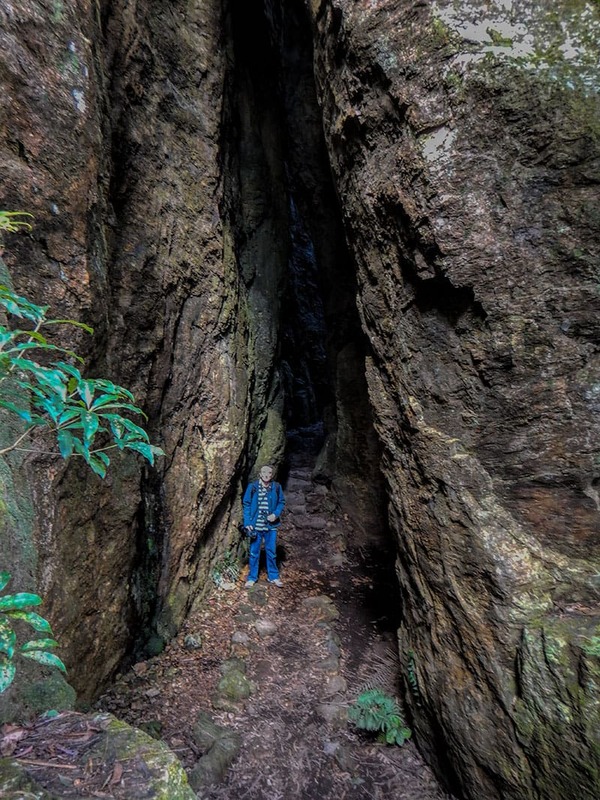 It’s a big call with so much stunning scenery and so many well maintained tracks throughout the Lamington, Springbrook and Tamborine Mountain National Parks. Last weekend was our first visit to this track which forms part of the Scenic Rim and the World Heritage protected Gondwana Rainforests of Australia. 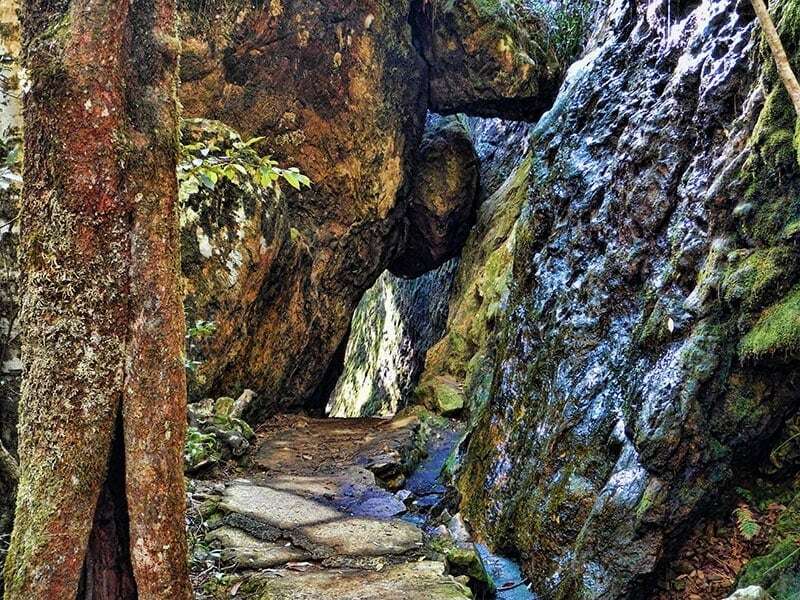 The whole area is stunning with prehistoric rock formations, lush rainforest, 4 stunning waterfalls and dramatic lookouts. There is so much to see on the Twin Fall Circuit and it’s only 4km and a grade 3 track making it assessable to most people of average fitness and mobility. 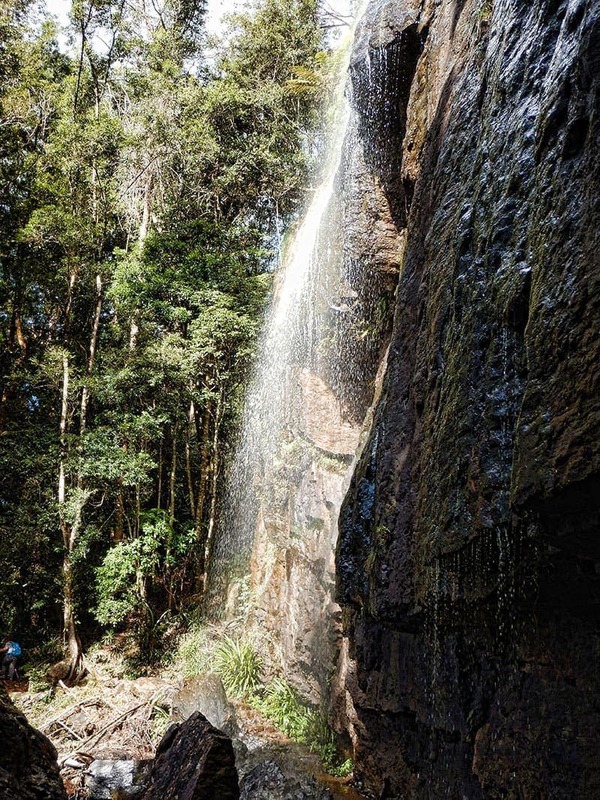 If you want something a bit more the Warrie Track at 17km looks amazing and the 54km Gold Coast Hinterland Great Walk passes through very near Twin Falls, an entry point is at the Apple Tree Park just down the road. 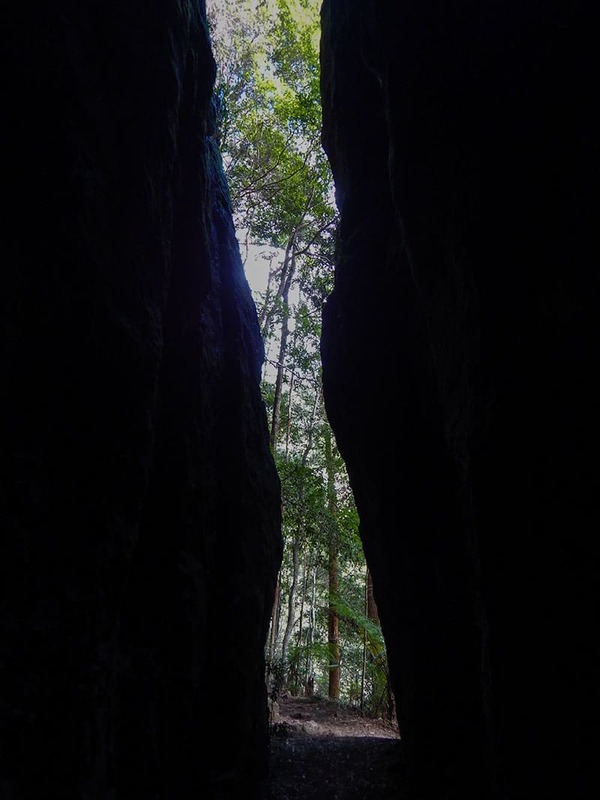 The Springbrook National Park area was formed 23 million years ago and it’s pristine state makes it extremely important on an international scale. The Springbrook Plateau was once the northern face of a huge shield volcano that dominated the area at that time. The volcano was about 80 kilometres across and 2,000 metres high, over 6,000 km² were covered in it’s lava flows that were up to 270 m deep in parts. The basalt, rhyolite and pyroclastic rock formations that are dominant throughout the region today were formed during that time. It’s the ryolite that makes up the sheer cliffs. The volcano began to die about 10 million years ago and over the millions of years that have passed since erosion carved out a crescent of vertical cliffs. It extends from Springbrook to Lambington plateau and to the Tweed Range above the Mt Warning valley vent. The erosion continues to shape and change the local landscape you can see another interesting example on a short walk also within the Springbrook National Park at the Natural Bridge. 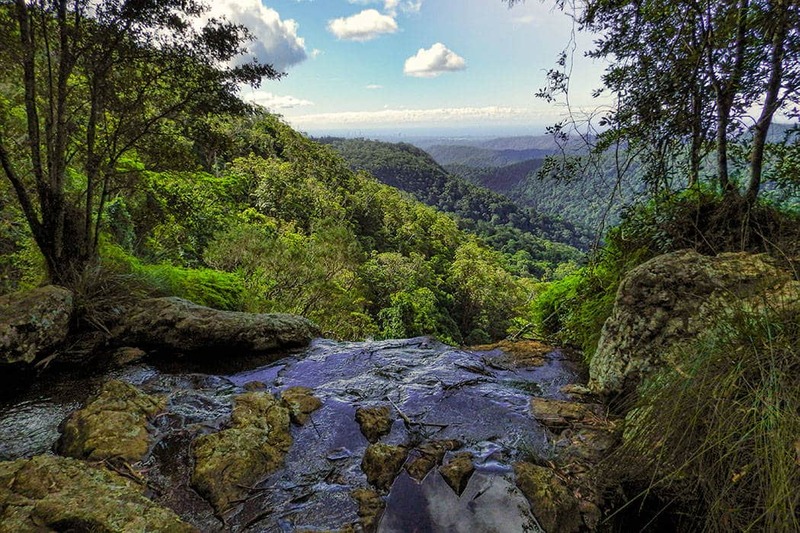 The ‘Best of All’ Lookout is 5km away and gives panoramic views across the region and takes in both Queensland and across the border into New South Wales. 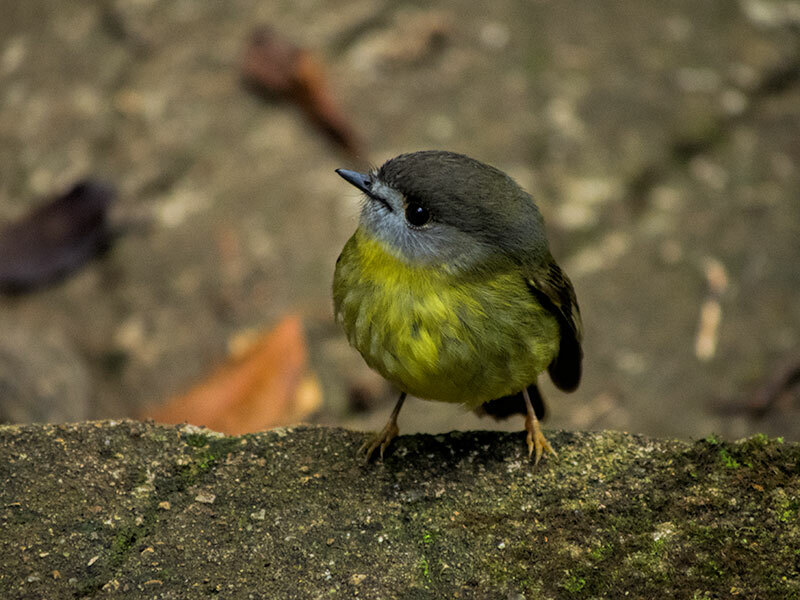 We’d heard that this region was important for both flora and fauna and before we’d even left the picnic area we’d seen a couple of pademelon and a variety of birds including yellow-throated scrubwren and Eastern yellow robins. We walked the circuit anticlockwise which turned out to be a good choice. I always prefer to walk down a slope and climb up stairs than vice versa. 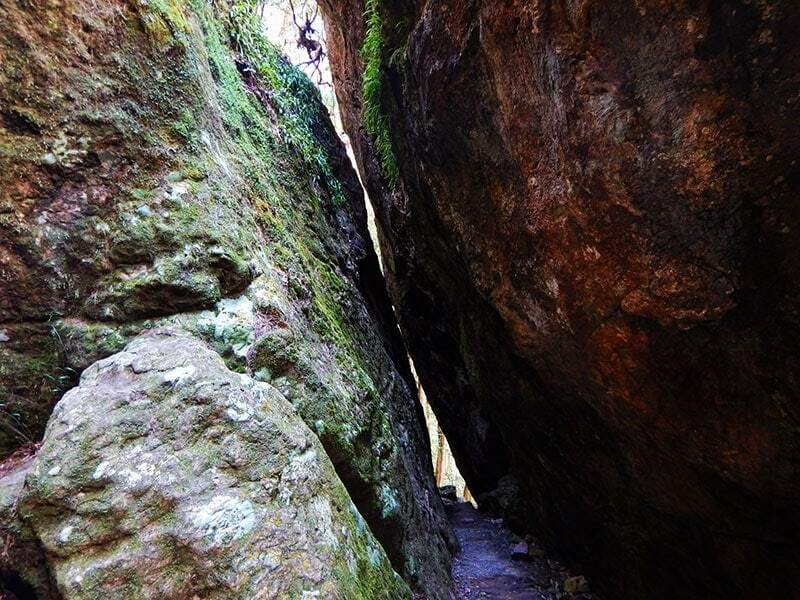 In several places you walk under rocks or through a narrow divide between two rock faces. 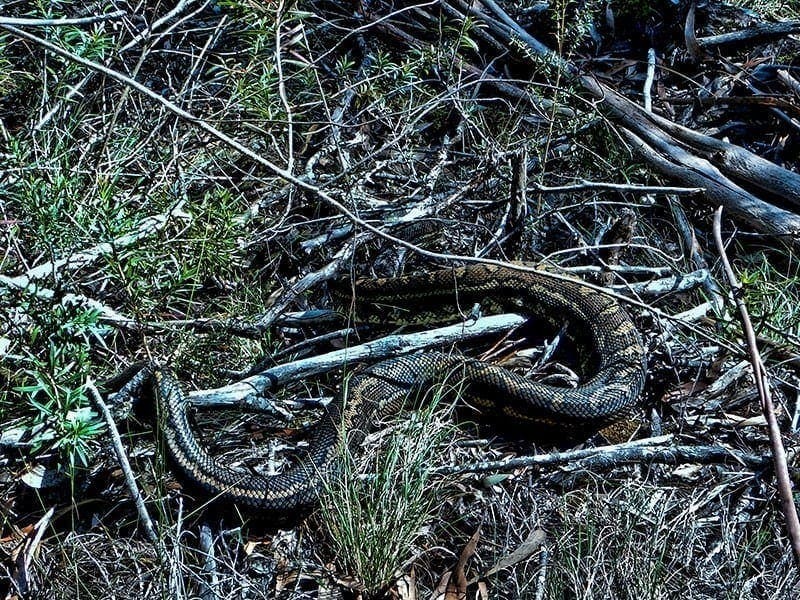 In one spot we found a moderate sized carpet python soaking up the winter sun, he was obviously quite lethargic in the cooler climate as although he was aware of people he wasn’t interested in moving off of his patch of sunshine. It looked like a child hiding, he’d tucked his head under a pile of fallen branches and had left the rest in plain sight and warmth. He was the only snake we saw through out the walk and there was a surprising lack of lizards too, the area is a good spot for seeing land mullet but we weren’t lucky enough to see them this time. Given the name of the circuit we’d hoped to see a good set of rainforest falls with at least some flow happening despite it being a bit dry lately. We hadn’t expected to see four sets of waterfalls in just 4 kms. In the local aboriginal dialect Tamarramai means ‘smaller’. These are the first falls we came too after passing through a walkway between two rock faces so while they might have been only a minor flow of water compared to those further on the height of the rock face they fell over wasn’t unimpressive. Unsurprisingly named for the two distinct curtains of water than fall from the cliff the twin falls land in a beautiful pool that in the warmer weather I’m certain would make a very nice swimming hole. You have the option to take the dry path in front of the falls or walk around behind them. Who can resist walking behind a waterfall. While there was a little spray last week you didn’t get significantly wet at these ones although I’m sure you could if you came after some summer rains. This is definitely where you sort the tourists from the locals, it’s July, the middle of winter, admittedly it’s 24 degrees celsius on the Coast but there were people swimming! In the local aboriginal dialect Tallanbana means ‘out of the rushes’ and these falls are on the other side of the swimming hole from Twin Falls. They were splashing over the path a bit and I didn’t get a good photo of them because of water drops on the lens. If you are concerned about getting wet you can avoid the spray completely by taking the front path and approaching from the other side. Even though the path was damp in places it wasn’t slippery. The last set of falls you come to are the Blackfellow falls and these ones you do need to pass behind to continue on the trail. We got a bit wet but not drenched, it was enough to need to put the good cameras back in the pack and use the waterproof for a few photos here. As you climb the hill again you’ll come to some rock pools that feed the falls. I believe that you can sometimes see the blue Lamington Spiny Crayfish here or even on the tracks at times after heavy rains. We had a clamber over the rocks and watched for a while but no crayfish came out for our cameras. This cheeky Pale Yellow Robin was keen to perform for us though so I thought he deserved a picture. You can start the walk either from the Tallanbana Picnic Area or from the Canyon Lookout. Although the walk is only 4km and a grade 3 make sure you are prepared for the conditions with water, insect repellant and non slip shoes that give some ankle support. 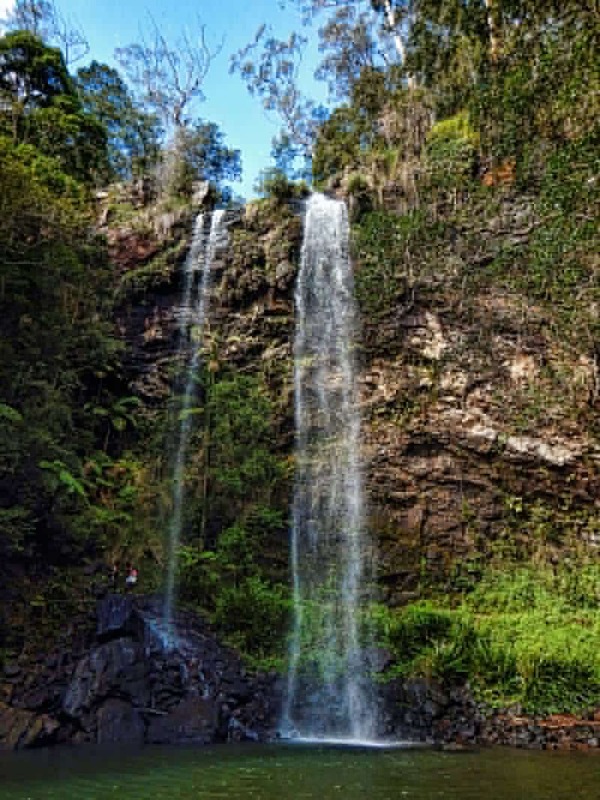 During the wet season you may also want a waterproof bag to protect electronics or anything water sensitive as the path behind some of the falls doesn’t remain dry all year around. 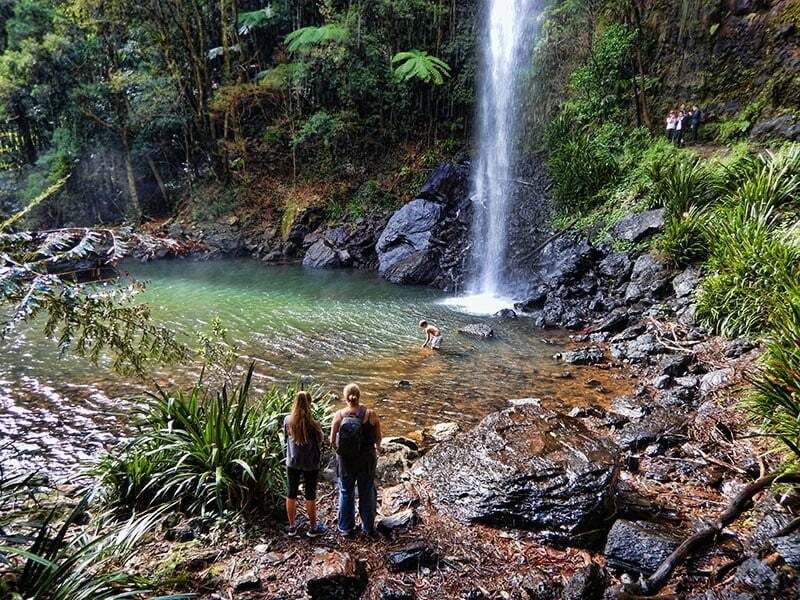 Enjoy your visit to the Australian rainforest, there are some unique and beautiful wildlife and stunning scenery to enjoy right around the country, many places such as the Springbrook National Park are surprisingly convenient to access from popular tourist and urban areas. Thanks for that Kira. We’re so lucky with all the beautiful parks and walks we have in Australia. Excellent information. The waterfall reflection photo is gorgeous. 24 degrees is chilly swimming for Queenslanders agreed? this is a great post! Thanks Jan. Did you get a chance to explore the National Parks while you were down on the coast? Beautiful pictures! It’s amazing to be in an area that existed so long ago. Thanks for sharing! I’m going to the Gold Coast next month and I’d love to do a hike. This looks amazing. What sort of elevation is the hike? Hi Sandra, I hope you get into the hinterlands while you are here, it really is beautiful. The elevation at the highest point in Springbrook NP is around 1000 metres above sea level, this walk is high enough for fantastic views but isn’t the top. I don’t have the gear to measure the elevation of the walk itself but you go from road level gradually down to the tops of the waterfalls then down to the base of the falls and work your way back up. The track is slope or steps all the way so no climbing skill required. Have fun! This is literally a hiker and photographer paradise. I’d LOVE to discover it for myself. Absolutely beautiful! This trek is one of the many reasons I’d love to return to Australia! Thanks for all the details, I’m going to keep this information handy for a future (hopefully!) trip. I know you said 24 degrees…but even still, that looks like a chilly swim at this time of year! What spectacular landscape. LOL yes 24 degrees and middle of winter – we think it’s COLD. Canadian tourists are tough! Do you know if is it possible to sleep in the park? 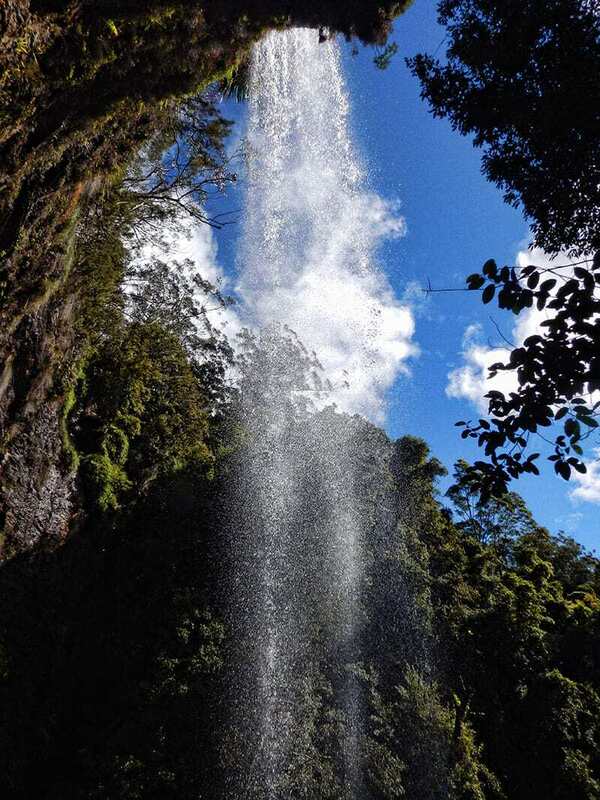 Hi Giulia, It really is a lovely area, the adjacent Lamington National Park is also very beautiful. At Springbrook you can camp at the Settlement Camping Area in the National Park and there are a few cabins and cottages in the area where you can stay nearby too. Great photos. I’d love to visit Australia – haven’t been there at all. In my head it’s all beach and desert – so good to see that there’s a different side to it! Lots of very beautiful beaches and no shortage of desert through the middle but there is also a lot of forest area. A lot of stunning rainforest like this is a relatively short drive from the beach on the east coast and as you get further into the tropical north the rainforest comes down pretty much to the beach edge. Those waterfalls are just stunning! And I love seeing the large, clear photos on your site. I wish I knew about this hike last time I was at the Gold Coast. Who knows when my next trip will be, but I will definitely not miss this whenever I’m back! I wouldn’t mind a long hike then finding these stunning falls. So not what I imagine when I think of the Gold Coast! But very beautiful indeed.